Have you ever felt like wishing of sending any type of file immediately to your friends and office colleagues on WhatsApp directly, instead of just contacts, images or documents? 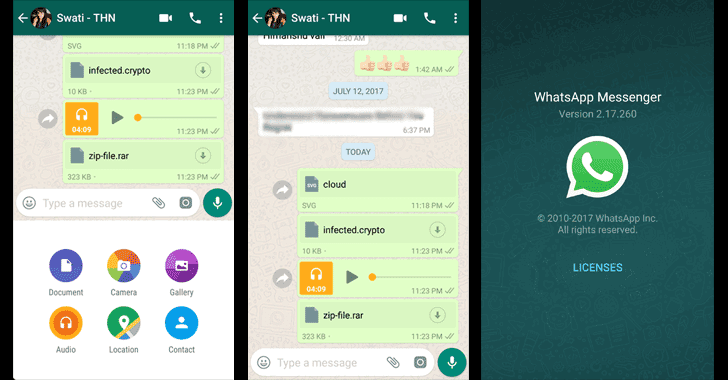 The latest version of WhatsApp for Android and iOS now allows users to send and receive any type of files, whether it’s .mp3, .avi, .php, zip files, or even APKs. The ability to send any file types also works on the WhatsApp-Web client. Last year, the popular messaging app launched video calling feature, end-to-end encryption, and two-step verification to all of its users. The next app update will possibly include emoji search, which is currently being tested by WhatsApp beta users.